I'm a mountain but I'll get over it! Journaling conceptual design trends, mostly as "stream of consciousness" as encouragement. Environmental resolve will teach us peace. Paradox mediation provides the next healthy attitude. Do I have to appeal to your better judgment to find out if you have developed more that one.. If you get a good position you think fate is deserved.. 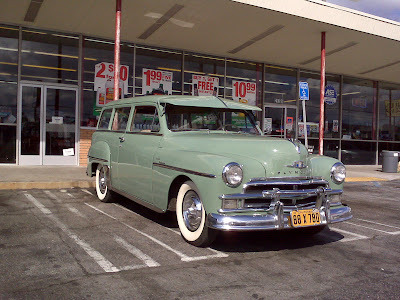 This two door wagon could be the first car I remember as "my" car, I saw "my" first movie, Bambi, at a drive-in with the seat down.. They called this color Seafoam Green. Social security was designed as an assurance policy to supplement the rights of life, liberty, and the pursuit of happiness. To remedy the malady of the Great Depression Social work was created in the spirit of care-giving. When insurance was sold as product it became a malignant parasite. The way I saw it grow with the acceptance of stock market investing and legalizing lotteries, it seems like assurances were forgotten for risky indulgences. Nobody was saving anymore because they thought they were covered. Conceptual properties aren't as trustworthy as a TRUST might imply. Profit works well for production (and selling products) but concepts like information and service must be given a quality of credit that values effort. Money is a monarch that dictates limits on values but it only seems to care about its' self importance. The Revolutionary War pamphlet called Common Sense was an argument to debate the concepts that support monarchy and dialog for three branches of self-supporting representation. Freedom from taxation means regulation should have kept insurance incorporation job markets from becoming gambling casinos. The Fed could continue to finance the gamble if three branches of economy were adapted to assure executive excesses stay in balance. The value of educational degrees of observational standards should mean kids come out of college with credits, not debts. Research and development is the purpose of branching out to assure the growth of The INFORMATION AGE. Invested interest should yield appreciation. The first thing we should learn from banking on derivatives is that the deficit is a promise for the future. How can the future be responsible for itself? Tax credits have reversed responsibilities, The top makes itself heavier while the real foundation of their wealth is their weakened victims. Then they keep downsizing opportunity for quality occupations that once kept criticism distracted. Their greatest power seems to be to stick their heads up their assets! Representation is the responsibility to be our government. Those who say less government is best are taking our representation from US. These are the behaviors that judge themselves. Authority behaviors separate themselves by being dominant. That is not adult equality but parentally acceptable bullying. People use blame and shame to represent threats that are symptomatically projecting from experiences they reflexively perpetuate from their teacher. This is like a conceptual self-cloning process that manufactures anger. Education evolves perspective by sharing a point of view in dialog with industrial production development. Structural engineering could a multilayered spectrum if we studied integrity. This is transactional energy recognition for relations that are renewable. Being normal is the trap of being like before, so NORMAL IS NOT as renewable as it is copying, even plagiarism. We have used up what was once considered normal and must progress. To respect progress you must understand partners as equal adults. Being progressive creates the healthy exercise of experimental regulation. Regular check-ups should be rewarded to participants in a healthy culture. Information and service can be well balanced in the medical practice of symptom statistics for resource management. Encouragement should be extended as healthy examples individual opportunities. The availability of care is the service branch of representation. Early diagnosis is worth investing in for the savings in caregiving procedures that advanced diseases seem to demand. Dis-ease is a natural discontentment of feeling of dis-abled by lacking attention. We all could be content if the deficit was reversed as a credit granted from a national bank of mediators to redistribute to the social consensus that keeps us all feeling well and fairly attended to. A well and fair nature is necessary for growing a healthy cultural attitude. Newspapers were the media and were subsidized from the conception of democracy as necessary representation for trustworthy dialog as a service to information as entertainment. Unity is the observation of a balanced response to harmful accidents with purposeful generosity as an entitlement. Anything seeming harmful is an accidental attitude that must be re-purposed with appreciation. The lack of appreciation is why communities seek freedom from authorities that over-rate their importance, and charge regularly for conceptual services they hope to rarely deliver. Insurance is conceptually a TAX! Social Security should be a concept of appreciating unity.. Appreciation is praise that is the root of the word prayer so I pray this rant is a seed of spiritual unity, with liberty and justice for all..